After negative reactions to an NRA ad featuring Killer Mike, the rapper took to Twitter to explain his side. 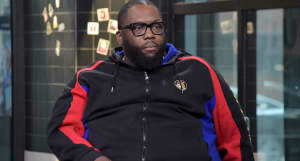 After appearing on an NRATV program talking about Black Americans' gun ownership on a segment, Killer Mike received ample criticism. Now, the rapper has taken to Twitter to clarify that his remarks about encouraging his son not to participate in protests were rooted more in the fact that his son was trying to skip school, not because of the political ideology behind the march. He also responded to a tweet from Joy Reid, the host of AM Joy, who wrote "Killer Mike cosigning an organization that traffics in threats against the media (including black women), that ignored Philando Castile, and that pushes gun sales through “brown/black scare” videos is his choice." "Joy I did an interview," Killer Mike wrote back. "That’s no more a “co sign” than me doing your show." He also implied that the NRA used his words "to inflame organizers of this worthy march," but was not a "rep" for the NRA. You can see Killer Mike's tweets below and the original interview above.